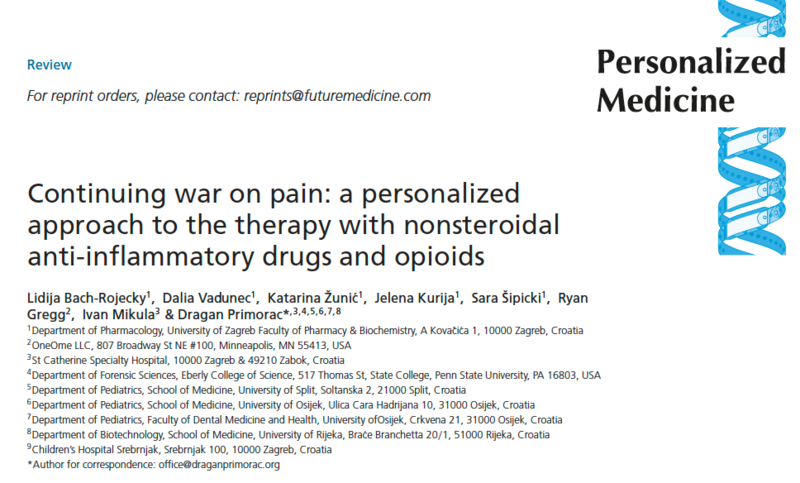 Personalised Medicine Journal just published our article entitled "Continuing war on pain: a personalised approach to the therapy with nonsteroidal anti-inflammatory drugs and opioids"
Personalised Medicine Journal just published our article entitled "Continuing war on pain: a personalised approach to the therapy with nonsteroidal anti-inflammatory drugs and opioids" where we underline the importance of pharmacogenomics (PGx). Successful painmanagement requires the delivery of analgesia with minimal risk of adverse drug reactions.Nonsteroidal anti-inflammatory drugs and opioids remain the mainstay of treatment for the majority of patients. Unfortunately, almost 50% of all patients experience inadequate pain relief and serious side effects. Allelic variants in genes coding for target proteins, transporters and enzymes, which govern analgesic drugs action and their fate in the organism, might explain inter-individual variability in pain severity and in drug-induced pain relief and toxicities. Additionally, it seems that epigenetic changes contribute to the highly variable response to pain treatment. Therefore, pharmacogenomic testing might be a valuable tool for personalization of pain treatment, with a multidisciplinary team approach involved. A couple weeks ago we at the St. Catherine Hospital and OneOme started collaboration by introducing RigthMed test with a goal to bring pharmacogenetics to the clinical practice. Everyone can benefit from the RightMed test, as it provides lifelong information about how an individual metabolizes more than 350 of medications.